Best Practices: What Is the Optimal Length for Video Content? By Mary Pedersen . Published on July 14, 2015. I suspect a few people have clicked on this article expecting it to be short, with the exact video length that ensures your content goes viral. However, best-in-class marketers understand there is no "one-size-fits-all" strategy when developing and optimizing your video marketing content. We hear it all the time: Viewers are seeing video content in more places by more brands than ever before. And because of this, their attention spans are getting shorter and their expectations are becoming greater. Marketers have just 10 seconds to capture and engage an audience before they continue to scroll down or click away; and engagement drops off significantly beyond that. 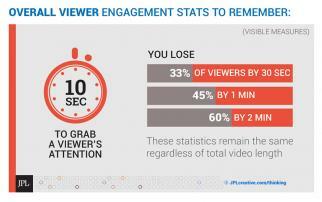 If you have not fully engaged your audience after the first 30 seconds, you've likely lost 33% of viewers; and after one minute, 45% of viewers have stopped watching. 1. What type of content are you offering? Great content comes in all forms and lengths, and a good video library includes a variety of content types. For example, a fun, entertaining video is best in a shorter, easily digestible length, while documentary-style branded content can be longer (upwards of two minutes). And don't shy away from those long-form videos. A TED Talk-style presentation can be great for those really engaged on a topic or brand. For longer stories, consider breaking them up in a way that makes sense to create several episodes. 2. How and where is the audience viewing the video? The device and platform on which your content is delivered is one of the most important considerations when determining how long your video should be. When sharing on social, keep it short. Facebook's auto-playback feature makes 30- to 45-second videos optimal; while Vine and Instagram have fueled the demand for less-engineered, "micro-videos" that are 15 seconds or less. In terms of video hosts, if you house your content on YouTube or Vimeo, viewers are open to watching longer, more stylized videos. Each platform has benefits and considerations, such as ads or competing content, that play an important role in the need for a good user experience in your video marketing. 3. What expectations does your audience have? An image of a person or people: This implies to the viewer that they're getting something fun and light -- and likely short. An image of a product: Images of products tend to see a lower click-through rate. Use these types of images for customers who already know your brand and want to spend time with you. Screen text: If the feature image is text, the viewer likely assumes he or she will be learning something, therefore spending more time engaged. 4. What action do you want the viewer to take? Do I want to simply entertain the viewer? Do I want them to take an action (sign up for an email list, purchase a product, share this content, etc.)? Do I want to educate this consumer or prospect? Let this also determine at what point in the video to insert a call to action. When you want a viewer to take action, don't wait until the end -- put it in the first 10 seconds. And finally, use analytics to monitor how your content is being received. Determine which videos users are engaging with most, what platforms are seeing the highest amount of viewers, and at what point in your video viewers are dropping off. Set KPIs and use learnings to continue to tweak and elevate your video content performance. 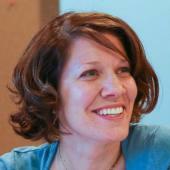 Mary Pedersen is creative director at JPL, a full-service integrated marketing agency based in Harrisburg, Pa.